I don’t know how it happened, but Easter is one of my daughter’s favorite holidays. We aren’t religious, so to me it was always sort of a non-event holiday. But when my first child, now 5.5, was born, every chance to do something special was embraced; maybe even overindulged. If you ask her today why she loves Easter, she’ll tell you it’s all about the candy. But honestly she never gets more than a few little pieces of second rate candy (gummy bears or skittles, not chocolate or anything awesome). It’s hardly the gorge-fest of Halloween. She doesn’t even like Peeps! Her little, bright plastic eggs were always full of stickers and tattoos, little single markers or the occasional tiny stuffed bunny, shoved uncomfortably into a bursting plastic cocoon. 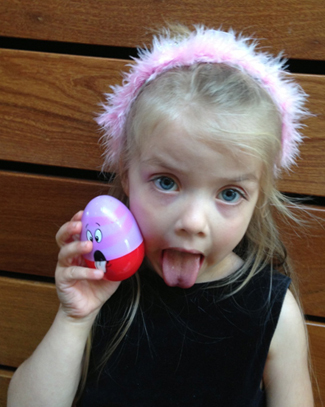 I think the real reason she loves Easter so much is the traditions we’ve inadvertently established. She gets to dress up in a fancy dress that she proceeds to get filthy from searching for eggs. She gets a small Easter basket usually filled with a few cheap items from Target and one stuffed animal. The highlight activity is, of course, the egg hunt. She gets tiny treasures in her plastic hunted eggs, like stickers and tattoos she doesn’t need, and yes, occasionally candy. We do the egg hunt in our yard. The yard is not big, we live in a city after all, and the eggs are usually pretty easy to find. But she goes out as a team, a slightly competitive team, with other kids and now with her little brother. The hunts are small, but they are fun. The feeling of discovery, and triumph and a little bit of treasure. Exploration/reward. Big win. And then there are the crafts. I’m crafty. My kids are crafty. Yet, for some reason I’m often too busy to sit down and make things with them. When I do get the excuse to set aside dishes, work, home improvement, and the siren call of electronics, we have such a great time. 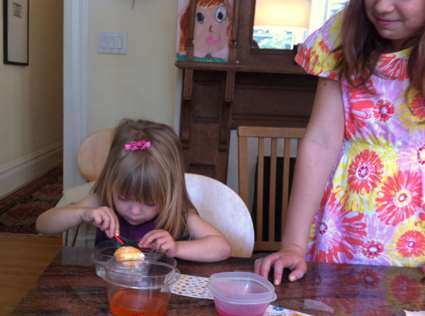 I remember the year we made glitter eggs. My daughter was so excited because, well, glitter! Then a few of the eggs cracked and she was crushed. We dyed them anyway and amazingly, the cracks created a fancy spiderweb pattern all over the egg. They were beautiful. Serendipity that, on another day, we might have been too busy to find. On another day I might have thrown them out, said a few comforting words with a hug, handed her the crayons instead, and gone on with our busy lives. And most importantly, we have spent every Easter she has been alive with special friends. Whether it is our dear family friends or my cousin, our only family in town who has two daughters old enough to think little kids are cute, it is always an intimate get together at home without all the hoopla of Christmas parties, or Trick or Treating, or the raucous beautiful chaos of a birthday. So maybe I do know how it happened, how Easter became one of our favorite days of the year. We spend special time with special friends, we do crafts together, my daughter wears a fancy dress that spins, and the kids go on a treasure hunt. What’s not to love? We all take the time to stop our busy lives and just be together. I think it’s really that simple. We all know how important together time is for a family but I guess sometimes we need an excuse to follow through. That’s what has really made the holiday something important to my daughter. But she’ll still tell you it’s the candy. How does your family enjoy celebrating Easter? Terri serves as Director of Art and Animation for Gooseling, Inc. With 17 years of experience in the game, film, and television industry, Terri created all the art and animation for the Cavity Dragons Jr. and Pro games as well as the Gooseling corporate logo art. Terri was Co-Creator and art/story lead of the original game franchise, Death, Jr. Her credits include 11 shipped game titles, 8 as Lead, art direction, and oversight for 7 additional titles, plus 2 years in TV and feature film.